The history of the Saracens VS London Irish fixture goes right back to the first year of the founding of the Irish exiles club. Formed in 1898 following the lead set by the London Scottish and Welsh sides, Saracens were amongst the first sides to play Irish on the 12th of November. The uninspiring 0-0 scoreline though suggests it was not a game dwell on at length. The following year, Irish romped away to a 26-0 victory, inspired by their great out half Louis Magee, who was to earn 27 caps in the era. This thrashing, and their quick ascendancy into the ranks of rugby’s elite alongside the Blackheaths & Rosslyn Parks, meant Saracens and Irish were not to meet again before the onset of the Great War. Despite the intensely complicated political situation regarding Home Rule back home, Ireland was still part of the United Kingdom and responded heroically to calls for recruitment. The “The London Irish Rifles,” raised 3 battalions and were to first see action in May 1915. Similar to the situation at the London Scottish battalion with Highland regiments, when they became oversubscribed those enlisting could be moved to the Irish regiments historically limited to recruiting from the more rural areas. 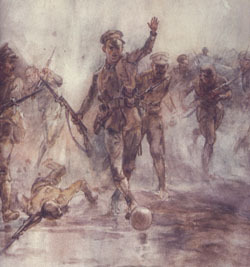 The clubs official website notes that “Many of the clubs members were amongst the soldiers of the Irish regiments that lost their lives in 1914-18.” As well as numerous battlefield honours the London Irish has became especially famous due to the famous painting by Lady Butler of rifleman Frank Edwards kicking the football into no mans land. Supposedly the first, but by no means the last of these incidents. Why not a rugby ball though? Whilst sport was actively encouraged by the army as vital to keep both physical fitness and morale up, and despite the fact rugby was often the sport of preference for those most senior, it was football that was most commonly played. 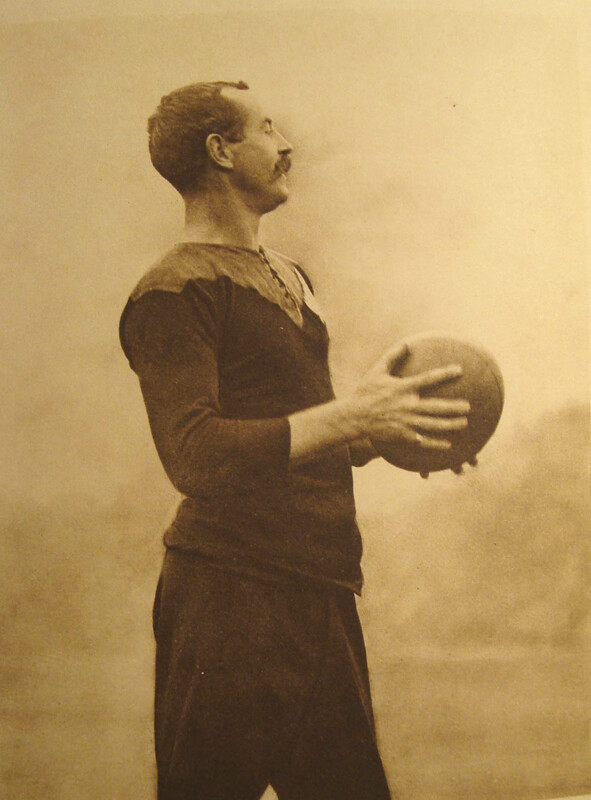 Tony Collins explains the reason for this as “rugby was generally viewed by officers and men alike as a game almost exclusively for officers: soccer was the sport of the ranks.” There was both then the ignorance of the rank and file men to the complexities of the game, and a deliberate effort to keep rugby as an exclusive sport, that precluded it being more widely played. It was not wholly absent from the Western Front however. There is a general belief that Edgar Mobb’s brigade, (who I will cover during the Northampton fixture,) and the 16th Battalion Northumberland Fusiliers had kicked a rugby ball out the trenches, although sadly little hard evidence of this exists. Behind the front lines rugby was indeed growing in popularity. Whilst every battalion had a football team, indeed almost every platoon had its own football team, the same had not been true of rugby. Its popularity behind the lines was to grow however, and it enjoyed somewhat of a “Golden Age” in 1916, especially with the influx of South African and Anzac soldiers knowledgeable on the game. Probably the most notable of these players was Dave Gallaher, the All Blacks captain in 1905 who enlisted despite initially being too old, who was to die serving at Passchendaele in 1917. As an enduring mark of his sacrifice the Dave Gallaher trophy is still competed over between France and New Zealand today. We hope that such foul play is kept to a minimum today, but wish the teams the best of luck this afternoon. We can confidently predict it should be a touch more entertaining than their very first 0-0 draw fixture!